The application is typically to transfer material from a big bag into a suction pipeline. We use a feed adaptor with a universal interface to connect to the big bag unloading system. The feed adaptor is designed to optimize the flow of the material in the pipeline with multiple valves for adjusting the airflow. This feature is essential to control the flow of material in order to avoid damage to the product and to reach the requested conveying capacity. Piab also offer different solutions and techniques to facilitate an easier material flow out of the Big Bag. This is however very dependent on the conditions of the material and has to be evaluated case by case. Increased uptime thanks to the hygienic design makes it easy to clean. Improved working environment as it is a closed system with no dust contamination. Create safe environments as the conveyors meet industry standards of ATEX Dust and Gas. The conveyors are available with all material in contact with the conveyed product in compliance with FDA, EC No. 1935/2004 and EC No. 10/2011. Increase the throughput and minimize the scrap with the conveyor especially designed for fragile material. 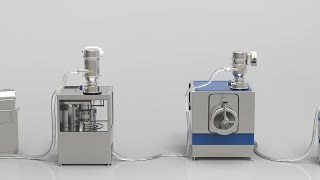 Flexibility in which vacuum source to use, the conveyors work equally well with an ejector pump or with a mechanical pump.